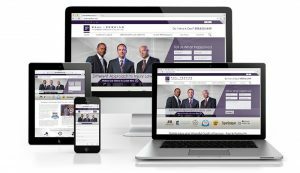 Attorneys Design Studio | Your Source For Professional Law Website Design & SEO! Welcome to Attorneys Design Studio. Your Source For Professional Website Design & SEO! Attorneys Design Studio has been providing custom website design, expert search engine optimization, web monitoring, consulting, hosting, domain sales and many other valuable key web services and products for attorneys throughout the United States since 2003. Although our company is relatively young, our experience in attorney web design and search engine optimization dates back to 1999. We have worked with some of the top criminal, divorce and personal injury lawyers in Texas. Searching for a professional web design firm to build your law firm a custom designed website with internet exposure? Look no further than Attorneys Design Studio. We specialize in attorney website design and search engine optimization, having designed and optimized hundreds of attorney and legal websites over the past 3 years. Our SEO specialists are among the best in the legal industry and we can put your website in prime position to drive new clientele to your law firm. 0.1 Attorney SEO Marketing, Search Engine Optimization For Lawyers, SEO Website Marketing For Law Firms. Attorney SEO Marketing, Search Engine Optimization For Lawyers, SEO Website Marketing For Law Firms. Attorneys, get top results on lawyer directories, Google, Yahoo & Bing! Our Chief Webmaster and our Web Operations Team have positioned over 40,000 attorney/client pages in the top ten rankings of the major search engines and we can get your attorney website positioned favorably too! Jump start your new business development plan by getting your website seen by internet viewers all over the world. The old ways of marketing for attorneys, lawyers and law firms are slowly dying out and now is the time to consider new ways of attracting your core clientele on the web. A professionally designed legal website with prime positioning on the web is a very important key to your law firm’s success! Our company designs and develops Websites for Law Firms and Attorneys. We have showcased some of the Best Law Firms and Lawyer Websites. We create websites that attract visitors and convert those visitors to take the desired actions so that they become your potential client. If you are looking for a new website or a considering a redesign of your current Law firm website, do get in touch with us and our team will give you a call for a free consultation. Attorneys Design Studio specializes in the professional design of law firm websites. We offer custom designed websites to suit your taste, professional demeanor and style. We will create a site that not only reflects the personality of your firm but also promotes your firm with a design that you can be proud of. Our designers are highly professional and prepared to create the website that you have envisioned. Don’t go crazy trying to design your website or go to one of those do it yourself website companies. Please contact our sales and marketing staff today to discuss your web design needs. 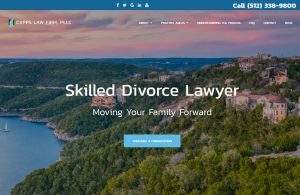 The Law Office of Austin divorce attorney, Kelly J. Capps , is a full-service family law firm. They are a specialized firm focusing exclusively on divorce and family law matters in Travis, Hays and Williamson Counties. Recognizing that divorce can be a difficult experience, they place great emphasis on dignity, integrity, and compassion for individuals who are enmeshed in the emotional and financial issues of family law matters. These unique challenges call for creative solutions and a customized approach to meeting your needs. As an Austin divorce attorney, Capps concentrates on understanding your ultimate family goals, and formulate the best options for achieving them. In emotionally unsettling and stressful situations, we bring an air of stability and calm. To be the most effective advocates, they give personal attention, listen carefully, and focus on the nuances of each client’s case. As a divorce lawyer, Kelly J. Capps is committed to the highest standards of moral and ethical conduct, while vigorously and effectively representing our clients’ best interests. Attorneys Design Studio brings you the latest in cutting edge search engine optimization with our Chief Webmaster, having honed his analytical skills since 1998. Our team of search engine optimization specialists have the wherewithal and the experience to handle both intermediate and advanced internet marketing campaigns via our proven SEO methods and techniques. Search engine optimization is a complex array of positioning factors that are organized, graded and formulated by priority, then applied to your web pages, thus creating an environment conducive to attaining high rankings on the web. The SEO specialists at Attorneys Design Studio can manage your search engine optimization marketing campaign and get your company the exposure it needs to bolster your new business development program. Attorneys Design Studio webmaster pro consulting services provide fresh new ideas, professional insight and expertise with respect to your current website and your search engine positioning on the web. Our webmasters will breakdown your site on many different levels including a complete analysis of its esthetic appeal, search engine traffic and ranking on the major search engines. Many people had their websites designed more than three years ago, about 70% of them. Three years in the world of technology is a lifetime. Old sites from a few years ago compared to the sites of today are like comparing fashion in 1970 to the fashion of today. How is the look and feel of your site? An amazing firm. Their communication, cost, expertise and the ability to get the job done on budget is truly remarkable. Couldn’t be happier and I would recommend them to anyone looking for web design work! Plus, they take pride in the finished product so every site they create is way above the average! – RICHARD W.
Working with them was an excellent experience. I can offer my highest recommendation for them in terms of their competence, responsiveness, customer service and adherence to making sure every detail of the project came through. I will very definitely use them again in the near future. It was a real pleasure to work with this team. – JOAN H.
Serving Attorneys, Lawyers & Law Firms in Alabama, Alaska, Arizona, Arkansas, California, Colorado, Connecticut, Delaware, DC, Florida, Georgia, Hawaii, Idaho, Illinois, Indiana, Iowa, Kansas, Kentucky, Louisiana, Maine, Maryland, Massachusetts, Michigan, Minnesota, Mississippi, Missouri, Montana, Nebraska, Nevada, New Hampshire, New Jersey, New Mexico, New York, North Carolina, North Dakota, Ohio, Oklahoma, Oregon, Pennsylvania, Rhode Island, South Carolina, South Dakota, Tennessee, Texas, Utah, Vermont, Virginia, Washington, West Virginia, Wisconsin & Wyoming.